Tonight, I went over a friend’s house for a good ol’ girls movie night in. Of course, we needed snacks! I have never been a big fan of popcorn (I know, I am so un-American! 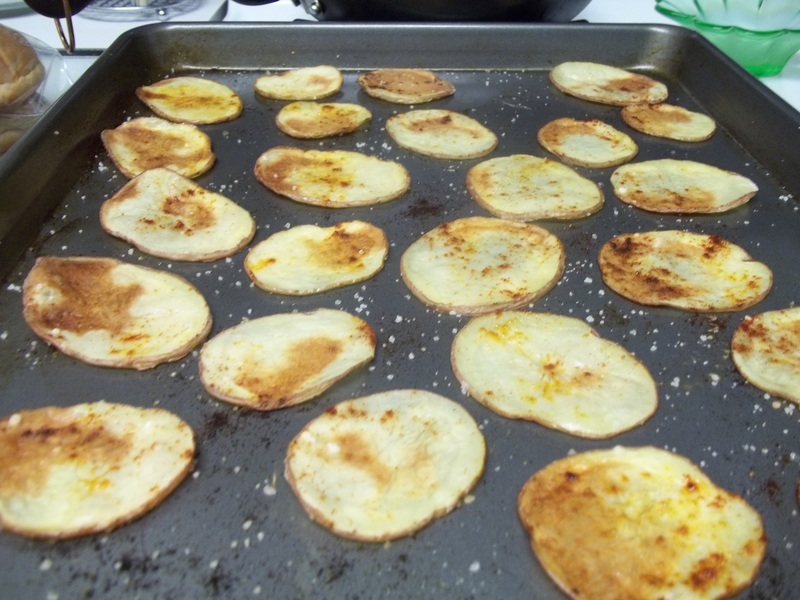 ), so I made a couple of alternatives…homemade potato chips and fried green beans. The perfect combination of crunch to munch on in between giggles. For the homemade potato chips, I washed a few small to mid sized potatoes, both white and red potatoes. Keep the skin on! Using a mandolin, I thinly sliced the potatoes several times for (what seemed like) a million slices. I then spread them out on a cookie sheet so that none of them were touching (very important), sprayed them lightly using olive oil in a mister, and sprinkled sea salt. Bake at 375 for about 10-15 minutes or until they get crispy. They start to get crispy when they marbleize brown and white. You can also add a variety of spices to top these off, including chili powder, paprika, or cumin. You may have to play with the timing, temperature, and thinness of slices to get your favorite crisp. 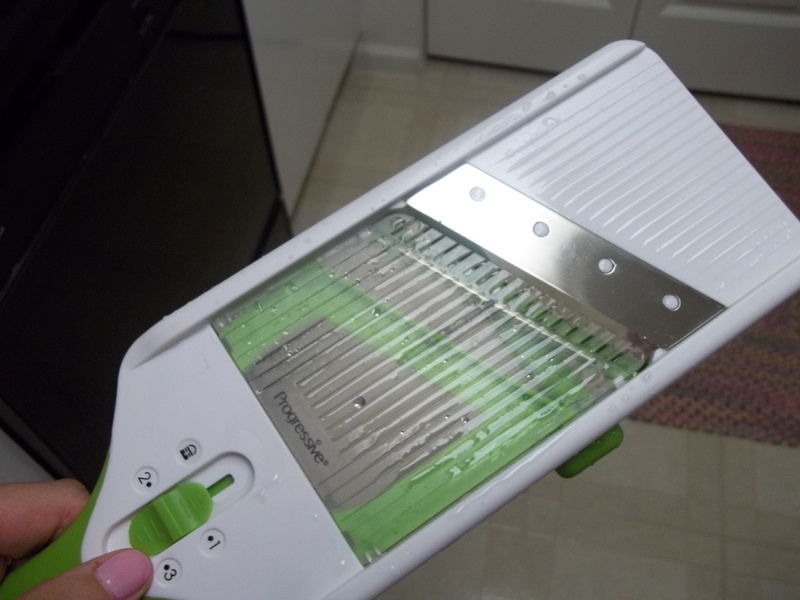 My mandolin… for perfect potato slices. 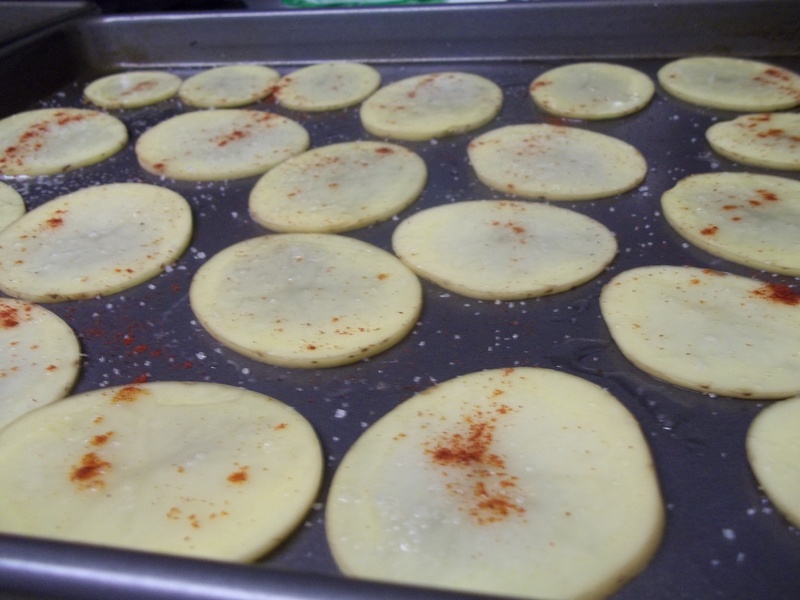 Potatoes after crisping in the oven. Marbleized! 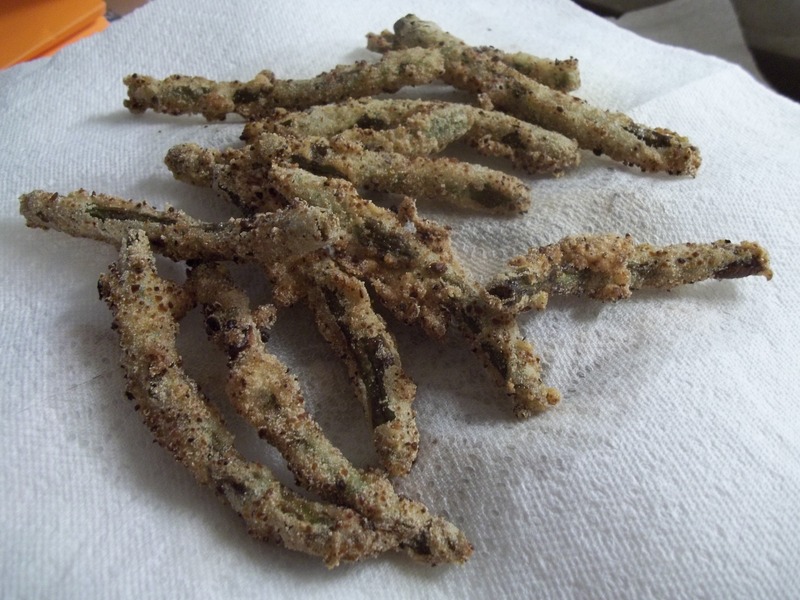 For the fried green beans, I referenced a recipe I found on Twitter from the Gluten Free Goddess. She used zucchini, but I adapted green beans. 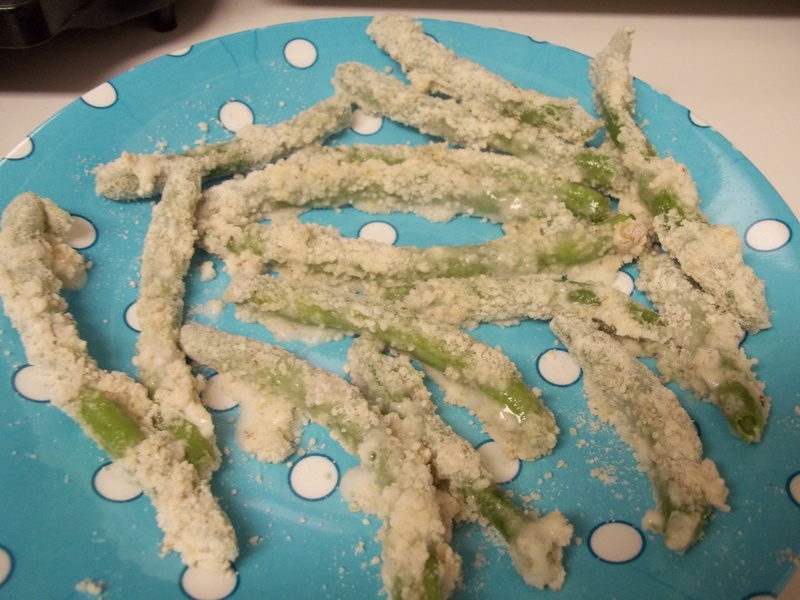 Once washed and trimmed, I dipped the green beans in an “egg” mixture (I used EnerG Egg Replacer and water… it was like the perfect food glue!) and then a mixture of rice flour and ground walnuts (about three quarters of a cup of each). 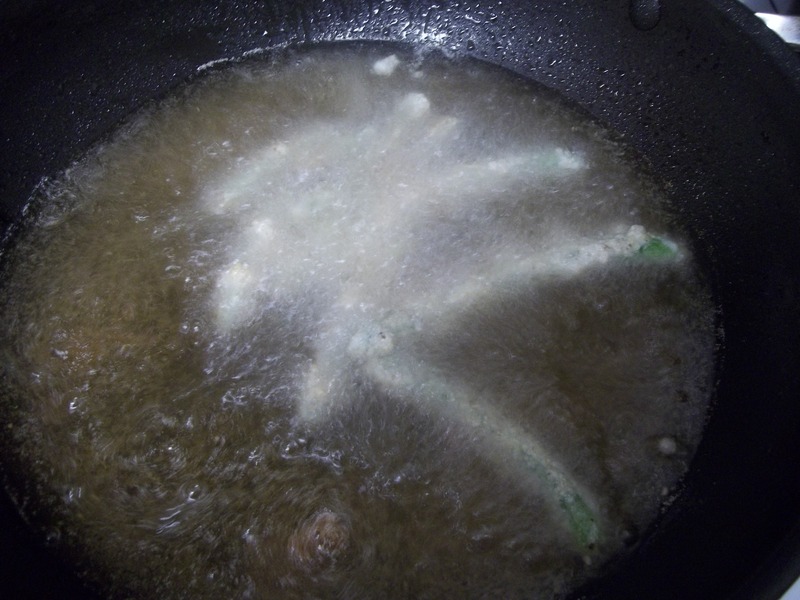 In an inch of hot oil over the stove, I placed the coated green beans in the oil until they crisped. Careful, hot oil sizzles! I then let them cool on paper towels. To dip these fried veggies, I made Cool as a Cucumber Sauce. Crispy, fresh, and delicious! The green beans all dipped and ready to sizzle! Action shot of green beans a’frying!